The advanced e-beam gun technology developed for the system produces high speed e-beam scanning (up to 100 kHz) and a small beam spot size (< 0.5 mm). 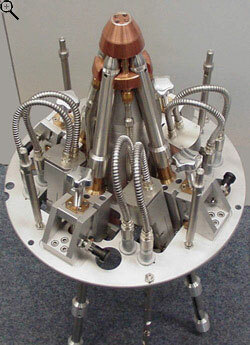 This allows multiple crucibles to be placed in close proximity to one another for precise heating and vapor mixing. Surrounding the crucibles with a gas jet enables vapor from the neighboring melt pools to intermix. Furthermore, the composition of the deposited layer can be controlled by altering the electron beam scan pattern to change the temperature (and thus the evaporation rate) of each source material. In essence, alloys with precisely controlled compositions can be created even when the vapor pressure difference between the elements is very large. with the incorporation of plasma activation technology, our system can create dense, crystalline coatings. The new tool uses a hollow-cathode plasma unit to generate a high density ionized gas and vapor flow just before the flow reaches the coating surface. This raises the activity levels and shapes the atomic structure of the growing film. 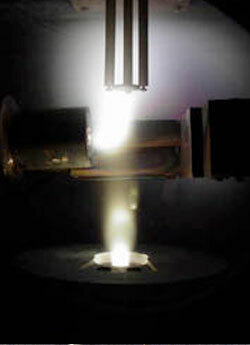 Plasma activation results in two processing advantages. First, it provides enough kinetic energy to the vapor to create desirable reaction products from simple precursors. For example, the plasma can provide enough energy to promote oxidation or nitrogenation reactions from molecular oxygen or nitrogen gases. The precursors used in other processes, such as chemical vapor deposition, are often dangerous and difficult to synthesize. Second, the plasma generates ions that can be accelerated towards the coating surface by either a self-bias or by an applied electrical potential. Increasing the velocity (and thus the kinetic energy) of the ions, by using an applied potential, allows the energy of depositing atoms to be varied and the atomic structure of coatings altered. The system incorporates both AC and DC substrate bias systems: the DC bias is valuable when coating surfaces with conducting layers, while the AC pulse bias is valuable for nonconducting layers.